There is a lot here to like. 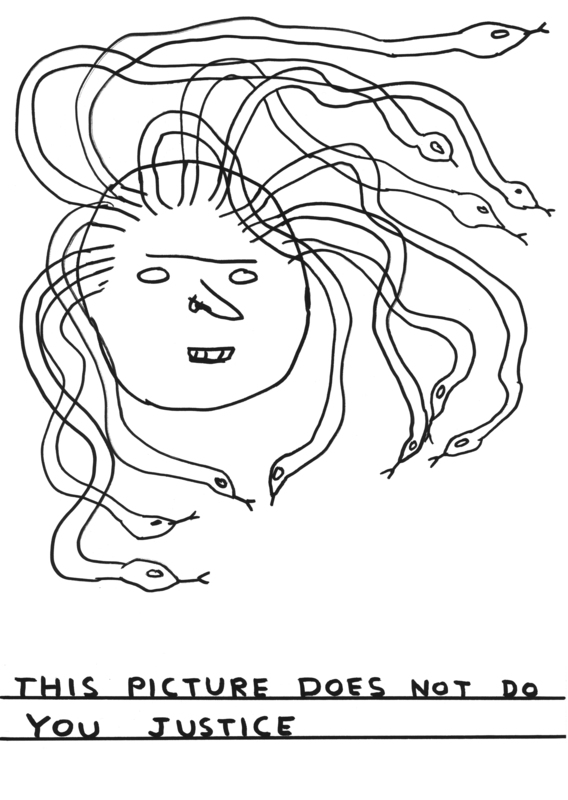 The drawings for which Shrigley is best known – rightly in my view – work because the naive drawing style works so well with Shrigley’s sense of the absurd, but they are best seen as small drawings which is why his books work so well. His sense of humour – often dark and almost always abstract – also works well in his photographs, and a grid of these is a high point in the exhibition. There are also a couple of walls of large drawings and a grid of paintings. For me, though these carry all the signifiers of the book works they don’t work as well on this scale or viewed with an audience. I think the problem here is that a gallery wall is unlike cinema – where a shared experience makes comedy all the stronger – though several people at looking at the work at the same time, we are all somewhere different in the experience, so your laugh may not fit at all with the work I’m looking at. Nonetheless, I enjoy the drawings well enough, just not as much as I would when looking at them in a book. 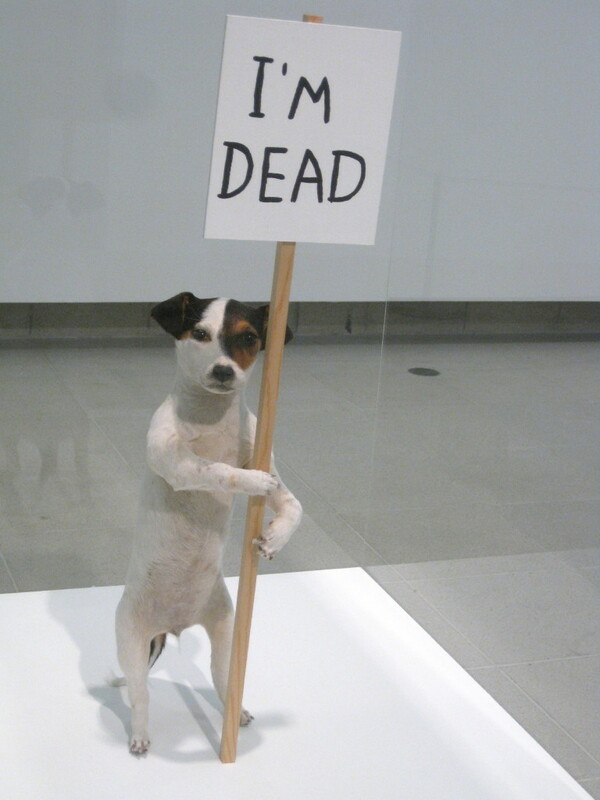 With a few notable exceptions, such as I’m Dead which also breaks my general rule of not much liking taxidermy in art, it’s Shrigley’s sculpture that really doesn’t work for me. The Hayward show did little to change my mind. 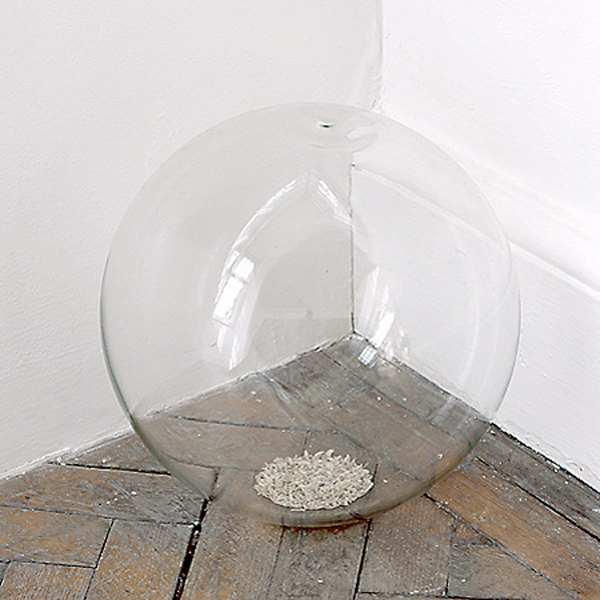 Looking at his sculpture, I always end up with the nagging feeling that Shrigley – wrongly – thinks that the drawings will be dismissed as just cartoons and won’t count as proper art so he somehow feels the need to prove himself by making other works. His recent exhibition at Stephen Friedman Gallery was split across two spaces. In one, cartoon bomb sculptures left me cold while the drawings in the space across the road charmed me. There is one sculpture I find myself both horrified and faintly relieved to see again though. I first saw Five Years of Toenail Clippings – a depressingly Ronseal work if ever there was one – in Shrigley’s 2002 show at Camden Arts Centre – where the pattern of liking his drawings and wishing he’d stop making sculpture was set, I think – and in the intervening decade I’d started to think, hope even, that I’d imagined it. Though I can’t say I enjoyed seeing it again, I was at least relieved to know my imagination hadn’t been playing tricks on me all these years. The drawing at the top of this post summed things up for me. David Shrigley, this exhibition does not do you justice. 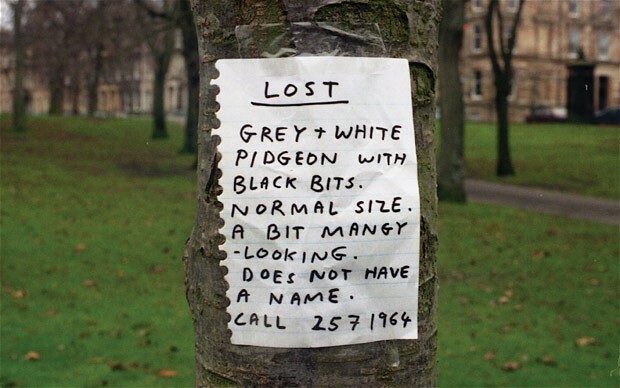 David Shrigley: Brain Activity is at the Hayward Gallery until 13 May 2012. Look at a book instead. 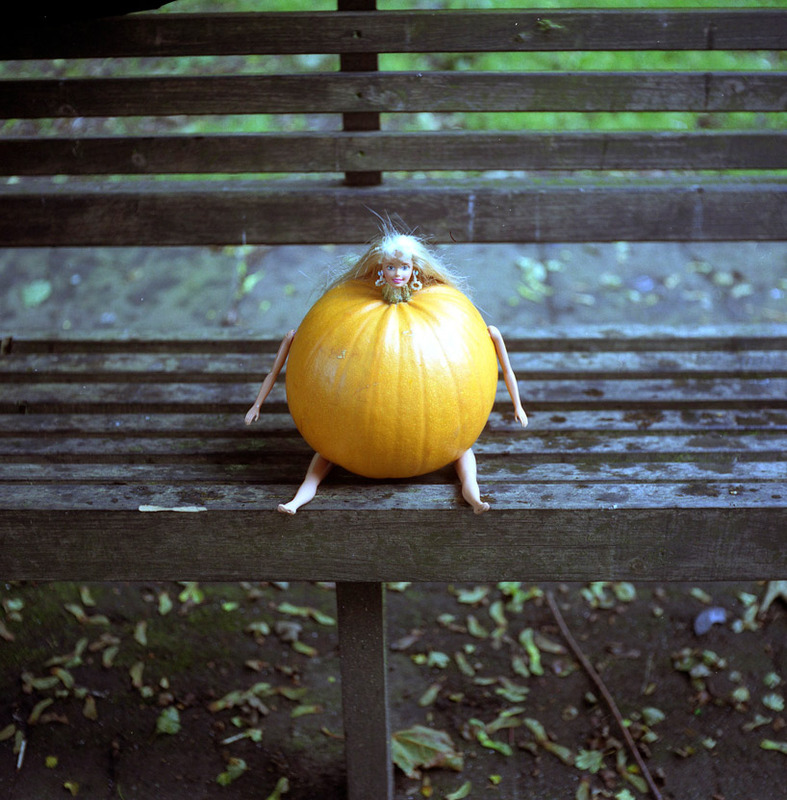 This entry was posted in Drawing, Film/Video, Photography, Sculpture, Text and tagged animation, art, Brain Activity, cartoon, comedy, David Shrigley, David Shrigley: Brain Activity, drawing, Hayward Gallery, humour, I'm Dead, Lost, photography, Pumpkin by Ann Jones. Bookmark the permalink. Yeah, sorry, the Ronseal reference would probably only makes sense in the UK and Ireland. Ronseal make paints and other DIY products that are advertised with the slogan ‘it does exactly what it says on the tin’. Many of my own feelings about Shrigley here, and I do think it’s a question of scale and, as you say, medium: a book does it better. The work I like is so text-dependent that it actually makes me uncomfortable viewing it in a gallery context – there’s nothing to ‘catch the eye’ for me; it has to be read, up close and personal, thus making the gallery context irrelevant and, indeed, a negative. As for the stuff that is designed to be ‘eye-catching’ and make of the exhibition a ‘proper’ show (the ‘sculpture’), my sense that this is its prime objective and reason for being included undermines any real appreciation of it. Thanks again, Ann, for sharing the links. Thoroughly enjoyable!